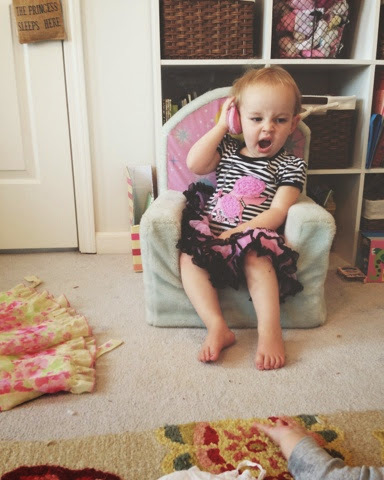 Tunes and Spoons: "phone, mama." About two and a half months ago I was sitting in the living room on the couch watching Avett kick around on the floor while Evaleigh walked around playing with different toys. I was having a breather from the crazy day and I'm sure I looked pretty checked out. My two year old came up to me, looked in to my eyes, pushed my phone in to my hand and said, "Phone, mama." It was a moment where I realized that she was much more knowing than I thought. All of those times where I was aimlessly scrolling facebook or instagram throughout the quiet moments in the day someone had been watching. To know that she noticed it was odd for me not to have my phone in my hands at all times was heartbreaking. I felt an instant sweep of guilt and knew that I needed to make some changes. As someone who enjoys blogging and sharing bits and pieces of our lives on the Internet, social media has really become quite a part of my every day routine. I have seen its positive and negative effects in my life. I have become friends with a community of people who I respect and admire. I've come in contact with people who I seek out their opinions and rely on for support. I have been blessed to share many special things from our lives and have enjoyed people rejoicing with us. But I will admit, with a hint of shame, that I am known to put more effort than should be given in to taking the perfect picture for my instagram feed or staging something that is not exactly natural just because I think it will get a good response. I find enjoyment in capturing beautiful things but in exchange I have often intruded on sacred moments of my kid's childhoods. Obviously as a mother I want to capture every thing my kids do and preserve it so I'll have it to look back on when they are older. Infanthood and toddlerhood is such a special time. Having those moments frozen through pictures are priceless to me and I find myself staring at those pictures mere minutes after my children have gone to bed. Their childhood seems so fleeting that I feel an urgency and anxiousness to capture it and immortalize it so I'll have it for years to come. I had a moment back in January when it snowed and I was outside with Evaleigh for her first snow. I kept pointing my phone at her face and telling her, "Smile, smile, smile, make a funny face. Evie look at mommy!" She put her hand up and said, "No picture mommy." I was a little embarrassed and realized that what was more important in that moment was letting her experience snow for the first time and me to experience it with her. Throughout most days I would wander from room to room following my daughter while holding my son and juggling anything else I was trying to carry while holding my phone too. I realized it had become a natural extension of my hand. I would look for it frantically when I couldn't see it, almost like it was a third child I had to keep close. Checking my phone had become a habit instead of a help. It was an addiction and not a simple device. I have noticed device dependency more and more in our society. It is evident in probably every public place we go. I see it at play dates, family get-togethers, restaurants, my own home, and even stop lights. It's no secret that smart phones and hand held devices have revolutionized the way we exchange information and have it readily acessable at our fingertips. There are so many positives to this advancement and I can testify that I have absolutely benefited personally from those changes. But I have also suffered from them. I wonder how many moments I may have missed out on because I had my head hung down in a phone screen. How many people have been ignored or tuned out because of this 'luxury of technology'? I'm so grateful to my husband who is much smarter than me. About three weeks ago I was so frustrated with myself and I was ready to sell my iphone and go to a simple flip phone. After spilling to him my desires and feelings about technology and it's influence in our lives he suggested I continue to keep my phone and just set limits for myself. He said that instead of completely eliminating the phone that I should give my chance the opportunity to succeed and that if I did so I would feel so much better about myself. So I did. 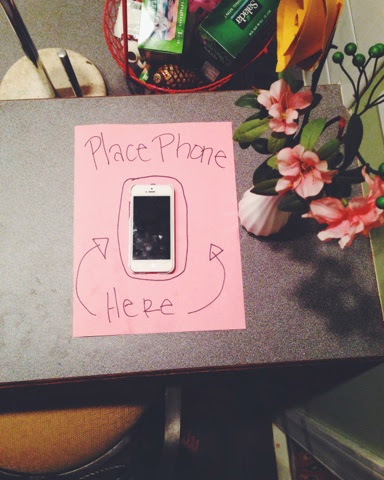 I came up with a plan to set aside a spot for my phone and to leave it there on silent throughout the day. I taped a piece of paper to the bar and drew a spot for my phone to sit. So far I have experienced many more meaningful and productive days. Our days before were filled with some phoneless moments and memory making but these new boundaries have enhanced the good that we have and have eliminated an unnecessary distraction in my life. I suppose it all comes down to priorities. My battle with technology leads to finding a balance. Will it be a text or time? Facebook or face to face? A picture or a private moment? Sharing or experiencing? Rachel, this has been heavy on my heart as well. I'm trying to limit my social media time as well. I took a month offing Facebook in February and I can honestly say I experienced more "moments". Loved the post! I'm reading a book with our community called "Living into Focus" I think you'd really really like it based on this post... check it out!